Mahindra's recently launched Marazzo MPV scores big at Global NCAP's crash tests. If you’ve been praying to see safer cars on Indian roads, it seems your wishes are finally going to come true as car manufacturers are finally paying heed to your demands. At least, home-grown car makers like Tata and Mahindra have started working on making their products safer than ever. 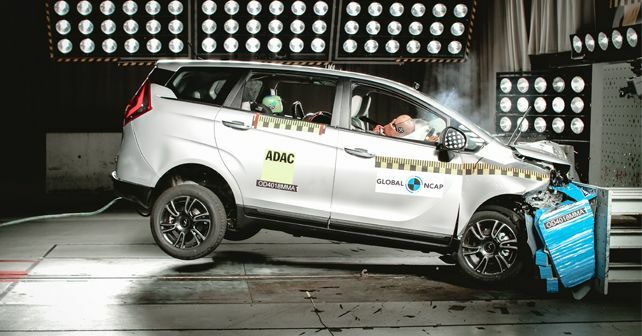 You see, Global NCAP just revealed that the Tata Nexon has scored a 5-star rating in its crash tests, and now that news is followed by the Mahindra Marazzo getting a stellar 4-star safety rating in the very same tests. The Mahindra Marazzo scored a 4-star rating in Adult Occupant Protection as it gathered 12.85 points out of 17. The Child Occupant Safety, however, was low at just 2-star. The model that was crash tested had double airbags, ABS, seatbelt reminders (SBR) for driver and ISOFIX anchorages - all are part of the standard safety kit in all variants of the Marazzo. Commenting on this achievement, Rajan Wadhera, President, Automotive Sector, Mahindra & Mahindra, said, “This is a proud moment for Mahindra as the 4-star rating for Adult Occupation Protection reiterates our commitment towards safety. We have designed the Marazzo with many new safety features to ensure a safe ride for our customers. With Safety being at the forefront for all our vehicles, I am sure that this recognition will spur us to achieve higher safety parameters for our entire range of vehicles”.